This set makes my poster bed look very elegant! Update the look of your bedroom with this 8-piece Comforter Set. This comforter set has an absolutly beautiful jacquard fabric detail and is made with 100-percent microfiber polyester. It is designed with a 15-inch drop length and the soft lavender and off-white fabric pattern adds a calming and warm feeling to your bedroom. A great value for the price. I have a hard time finding comforts wide enough for my king size sleigh bed due to the mattress being so thick. I like a comfort that hangs over the sides. So this one is great. However, I do want to alert Overstock quality control that the packaging was horrible. There was a gap in the middle of the box about 2 or 3 inches wide. Thank goodness the comfort was enclosed in plastic wrapping otherwise it was have been soiled. Not sure if this problem occurred during shipping or it left the source in this condition. It's the first time ever that I have rec'd a order in this condition. Love Love Love this comforter! I am super pleased with my purchase, the comforter fits the bed beautifully, I need to buy some euro pillows for two of the shams though. It's very cozy and comfortable and not at all too hot (and I live in south Texas, so that's saying something!) I read the previous reviews and noticed that they said the white was a bit silver but I am looking at it as I type and it looks more like a shimmering off-white to me! Either way, still a beautiful comforter and a great purchase, would definitely recommend! This is a very classy set. The purple is very true to color, the second color is more silver like, in case you are wondering. It really brings a nice subtle balance of color to my bedroom. 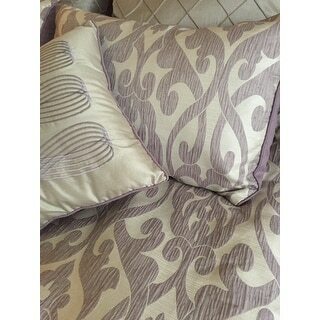 Of all my Overstock purchases, this king-size lavender colored damask print Comforter Set outshines them all! My husband even agrees, it's comfortable to lay on and not that heavy, yet just warm enough for winter nights down into the 40s to keep us toasty and snug. Makes my bedroom look like it's been remodeled with the best of materials! A great find! My mother bought this for me as an early Christmas gift, and wow, it's incredible.! You really cannot tell from the pictures just how pretty the colors are, or how lovely the fabric is... The comforter is light weight, however I will convert it into a duvet at some point in the future.. The bed skirt was easy to iron, and the light color is a little unusual in that sometimes it looks silver-ish, and other times a light white-beige... The 'purple' isn't a true purple, but in between a lilac and lavender... All the pieces make the bedroom look classy, and very comfortable.. I love everything about the set, and considering what my mother paid for it..? Absolutely AMAZING...!!! I was so pleased when I received this set. It is better in person, in my opinion, the perfect purple :) Washed beautifully in the gentle cycle. Thank you Overstock for a fabulous product and great price. The comforter set is amazing! It's not a heavy comforter ( which is great because I live in florida). It's pretty and the purple design is stitched ( not printed). The comforter looks more white in the picture, in reality it's a light metallic silver - still incredibly pretty though. My daughter spent a long time searching for the right style and price for her bedding. She settled on this set and she really loves it. Additionally, it came w/more than enough decorative pillows shams. Search long and hard for a comforter for side room- this is really pretty. It is light weight- so not for a long winter night- but great cosmetically with bed skirt and four pillows. Color accurate to picture. I love this set. It is beautiful. It is not shiny - although see my pics, with flash it appears shiny but I took some with flash and without. The fabric is cotton but it looks and feel more like a linen blend - without the wrinkling of linen. It is more of a silvery cream color and lavender on the comforter, whereas the throw pillows are definitely more silver. Some reviewers say it is cheap, it is not, although the comforter is not very plush, maybe that is why. It is definitely a great buy, especially for the price. You can't go wrong. I loved this set at first, but if you have animals I do not recommend this item! My dogs nails caught on it and snagged the fabric all over it. I washed the pillow cases a few times and they fell apart. Would probably be ok if you don't have animals/will get it dry cleaned. Very pretty, but i have pets and the material snagged easy. 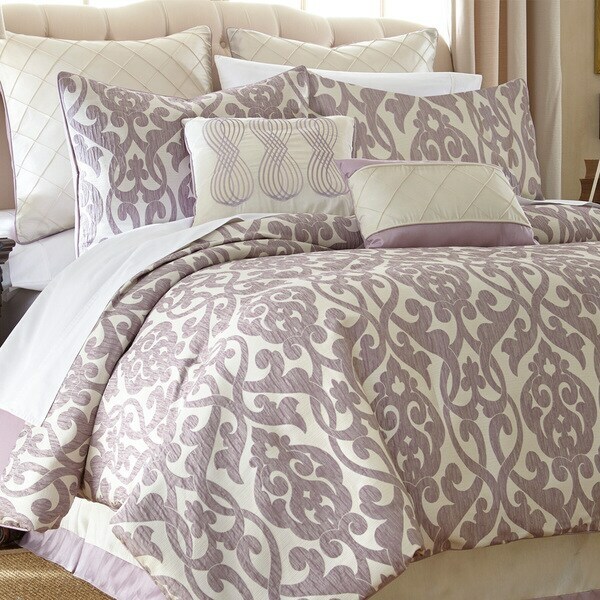 This is a beautiful comforter set that is well made, soft and durable. It looks great in our bedroom and we've already received numerous compliments on it. Very nice set, quality good, look great in room. Beautiful comforter set. It not only had comforter and shams, but also a complete sheet set. I thought the sheets would be cheap, but they were actually pretty nice and the price was just right. As always overstock provided a quality product and a great price! Looks beautiful in my newly painted bedroom. Great quality and soft not stiff like some comforters. I paired it with my rug from overstock and my room is like being in a whole new place. "When I select the comforter size, the queen size says off-white rather than purple like the king. What colors are in the Queen-Off white? Is it different than the picture that is shown?" "Will this work on a king size bed frame with a footboard?" The King size is currently in stock and can be used with a King frame featuring a footboard. "I have a pillow top queen size mattress. I'm trying to decide if I should get a queen or king. I don't want it to hang to the floor, but I don't want it to long either." I have always purchased king size when I have a queen bed. I have not noticed it to be to much longer. The pillow sham will be king size. I have the same type mattress and ordered the queen. It is perfect, especially since it has the beautiful matching skirt. I love this casual elegance set. "Thank you a lot for your answer; I have another question : I have a king size bed 180 x 200 mm .. could you give me comforter's set size in cm pleae? Because I think that your king size it's too small for me. Thank You! Simona"
Hello Simona, the king size dimensions of the comforter are approximately 269.24 cm x 228.6 cm. Thanks for shopping with us! "Hi! I'm in love in this comforter set but I dont't understand if the comforter it's heavy enough for an italy winter (i live in MIlan).. Than you"
Hello Simona, yes this comforter will be heavy enough for winter in Italy. Please let us know if you have any further questions. "Is the color lavendar and cream or lavendar and silver/grey?" Hello Julie, we try to represent the colors of our products accurately. Unfortunately, due to the difference in monitor colors we cannot guarantee that the color will match exactly what you see on your screen. In my opinion it is a lavender and cream/off white color. Thank you for shopping with us. "My king bed has a thick mattress and can you tell me how would the king comforter fit would it cover the mattress to the top of the bedskirt? I don't want one that will not cover the entire mattress and have to send it back. Thank you"
Hello sandy, if your bed is king size this set should not be too much or too little for your mattress. Thank you for shopping with us!